In 1996, a small Irish press approached Nuala O'Faolain to publish a collection of her opinion columns from the Irish Times. She offered to write an introduction to explain the life experience that had shaped this Irish woman's views. Convinced that none but a few diehard fans of the columns would ever see the book, she took the opportunity to interrogate herself as to what she had made of her life. But the introduction, the 'accidental memoir of a Dublin woman,' was discovered, and Are You Somebody? became an international bestseller. It launched a new life for its author at a time when she had long let go of expectations that anything new could dislodge patterns of regret and solitude, well fixed. Suddenly, in midlife, there was the possibility of radical change. Almost There begins at that moment when O'Faolain's life began to change. It tells the story of a life in subtle, radical, and unforeseen renewal. It is a tale of good fortune chasing out bad -- of an accidental harvest of happiness. But it is also a provocative examination of one woman's experience of the 'crucible of middle age' -- a time of life that faces in two directions, that forges the shape of the years to come, and also clarifies and solidifies one's relationships to friends and lovers (past and present), family and self. Intelligent, thoughtful, hilarious, fierce, moving, generous, and full of surprises, Almost There is a crystalline reflection of a singular character, utterly engaged in life. This book is not for everyone, that's certain. 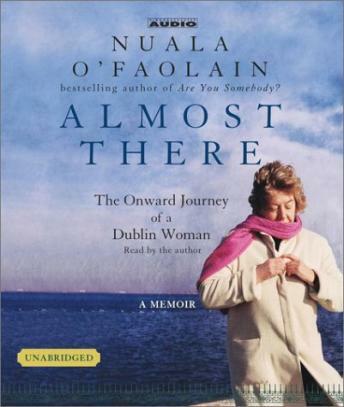 However if you are a woman and over 50, I heartily recommend that you read/listen to Almost There, as the chances are that you will feel you've discovered a real treasure. I am so happy that I didn't let the negative reviews on this site stop me from listening to Nuala - as they almost did. I had not heard of O'Faolain before this, and literally chose Almost There blind; however since reading Almost There I have mentioned her to a couple of my friends, both of whom knew her writing, had read it in their book clubs and were unanimous in their enthusiasm and furthermore said that Almost There stood out in their memories as stimulating the most animated and passionate discussions of all they'd read. I made it partway through disc 2 when I gave up. If the author had stopped after the first chapter, that would've been great. But she went on and on and on. In fact, at one point I thought "this sounds like a diary she had to keep for psychoanalysis." And then she made some comment about seeing an analyst, and that's when I gave up. I couldn't get through the first cd. Very slow. maybe i expected something differnt. I could not get into it at all. I loved listening to the author read of her own trials and successess. This is a good choice for women in the middle of their life wanting to reflect on what has been and what is yet to come. Though Nuala's life is vastly different than my own, I found listening to her experience an enriching one. Terrible. I barely got through the first cd! Love the accent, but very boring and depressing, did not keep my attention. I enjoyed her lovely Irish accent as she read, but her memoirs are whiney and tedious. As a middle-aged woman myself I could not relate to her lifestyle at all. O'Fauolin's narrative is as lyrical and beautiful as it gets. In the hands of a less competent wordsmith, this autobiography might of felt overly self-indulgent. But the author manages to impress not only with words, but with the way that she elevates her own experience and insights to a meaningful level beyond the confines of her own life. If you find yourself a bit restless at the beginning of the book - don't give up. You will be rewarded as you move further through the book. She is one of the best writers out there. I hope this book club picks up her other two books. Almost where? Nope. Didn't like it. There was no drawing in of the reader. No development of the character. I just didn't care and my mind kept drifting off to all the things I had to do at work or at home. While Ms. O'Faolain's writing itself is rich and flavorful, the premise of the book, as far as I could discern from the first few discs--a memoir of a woman writing about the process of writing an introduction to her writings--is so turned in on itself that it threatens to collapse into a literary black hole. I bailed on part one, and cancelled part two. Nuala O'Faolain is certainly witty and has a great sense of humor. She is at her best when making clever observations about life and the human experience. I did find myself increasingly annoyed at choices she made in her personal life and felt that the description I read of this book as a journey from misery to triumph was a bit misleading. I think Nuala still has a way to go, but I'll be rooting for her yet.